Go Direct CO2 Gas measures carbon dioxide concentration, temperature, and relative humidity. This sensor includes built-in temperature compensation and humidity protection. A 250 mL Nalgene bottle is included for running controlled experiments with small plants and animals. Measure the change in CO2 gas concentration during cellular respiration. Measure the change in CO2 gas concentration during photosynthesis. 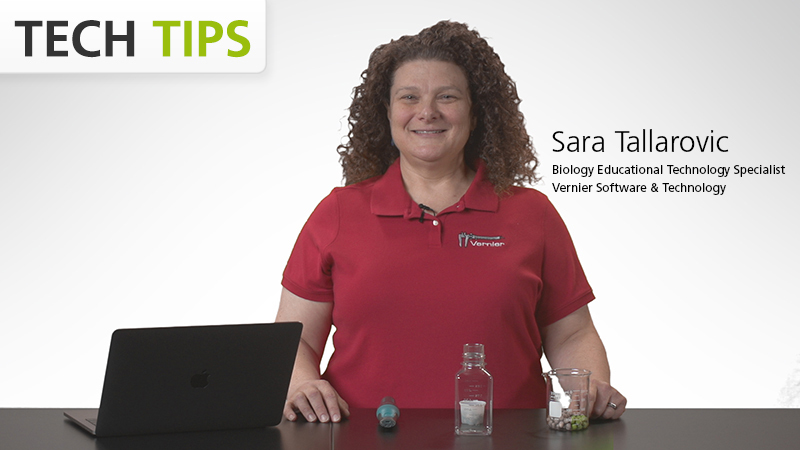 Study how yeast metabolize different sugars. Investigate artificial selection by comparing respiration rates of different yeast strains. Install Graphical Analysis 4 on your computer, Chromebook™, or mobile device. If using LabQuest 2, make sure LabQuest App is up to date. See www.vernier.com/ga4 for Graphical Analysis 4 availability or www.vernier.com/downloads to update LabQuest App. Turn on your sensor by pressing the power button once. The LED will blink red. If using Graphical Analysis 4, click or tap Sensor Data Collection. If using LabQuest 2, choose Wireless Device Setup > Go Direct from the Sensors menu. Select your Go Direct sensor from the list of Discovered Wireless Devices. Your sensor's ID is located near the barcode on the sensor. The LED will blink green when it is successfully connected. Click or tap Done. You are now ready to collect data. Connect Go Direct CO2 Gas to the included Micro USB Cable and any USB device for two hours. You can also charge up to eight Go Direct CO2 Gas Sensors using our Go Direct Charge Station, sold separately (order code: GDX-CRG). An LED on each Go Direct CO2 Gas indicates charging status. This channel measures the carbon dioxide concentration in the air. Units can be changed from parts per million (ppm) to parts per thousand (ppt), percent (%), or mg/m3. See www.vernier.com/til/3845 for more information. The readings are temperature compensated regardless of whether the temperature channel is activated. This is the default channel that is active when the sensor is connected. This channel measures air temperature inside the sensor. Units can be changed from °C to °F or K. This channel is not active by default when the sensor is connected. This channel measures the relative humidity of the air. It is not used to compensate CO2 gas readings. This channel is not active by default when the sensor is connected. Fill the 250 mL Nalgene bottle to the brim with water, take it outside, and dump the water to ensure it is then filled with fresh air. While still outdoors, insert the sensor into the gas sampling bottle that now contains fresh outside air. Take the bottle and sensor to where the calibration will be done. Start the software and identify your sensor, if necessary. Let the sensor warm up for at least 180 seconds before continuing. When the sensor has warmed up (readings should have stabilized), calibrate the sensor using a one-point calibration. Enter a value of 400 ppm for the sample of air collected. Once finished, the sensor should read very close to 400 ppm. The temperature sensor is factory calibrated and cannot be calibrated by the user. The relative humidity sensor is factory calibrated and cannot be calibrated by the user. Go Direct CO2 Gas contains a small lithium-ion battery. The system is designed to consume very little power and not put heavy demands on the battery. Although the battery is warranted for one year, the expected battery life should be several years. Replacement batteries are available from Vernier (order code: GDX-BAT-650). To store Go Direct CO2 Gas for extended periods of time, put the device in sleep mode by holding the button down for at least three seconds. The red LED will stop flashing to show that the unit is in sleep mode. Over several months, the battery will discharge but will not be damaged. After such storage, charge the device for a few hours, and the unit will be ready to use. Exposing the sensor to temperatures below –15°C or over 45°C will damage the sensor. Additionally, temperatures over 35°C (95°F) will reduce the battery's lifespan. If possible, store the device in an area that is not exposed to temperature extremes. Note: It is recommended that you wash the Nalgene bottle by hand. Most dishwashers will melt plastic bottles. Important: Go Direct CO2 Gas is neither waterproof, nor is it water resistant, and should never be immersed in water. If any liquid gets into the device, immediately power the unit down (press and hold the power button for more than three seconds). Disconnect the sensor and charging cable, and remove the battery. Allow the device to dry thoroughly before attempting to use the device again. Do not attempt to dry using an external heat source. Note: Damage due to liquid is not covered under warranty. Go Direct CO2 Gas measures gaseous carbon dioxide levels in the range of 0 to 100,000 ppm by monitoring the amount of infrared radiation absorbed by carbon dioxide molecules. Carbon dioxide gas moves in and out of the sensor tube by diffusion through the vent holes in the sensor tube. The sensor uses a small light to generate infrared radiation (IR). The IR source is located at one end of the sensor’s shaft. At the other end of the shaft is an infrared sensor that measures how much radiation gets through the sample without being absorbed by the carbon dioxide molecules. The detector measures infrared radiation in the narrow band centered at 4260 nm. The greater the concentration of the CO2 gas in the sampling tube, the less radiation will make it from the source through the sensor tube to the IR detector. The sensor also measures air temperature in the sensor shaft using a thermistor in an integrated circuit. When the temperature increases, the resistance of the thermistor decreases. The circuit measures the resistance value at a particular temperature and converts this to a digital signal. Relative humidity is measured in the sensor shaft using an integrated circuit that uses a capacitive polymer to sense humidity. The circuit produces a signal which varies with relative humidity. Very important: Do not place the sensor into any liquid. The sensor is intended only for measuring gaseous, not aqueous, CO2 concentration. Allow the sensor to warm up for at least 180 seconds before use. The warm-up process begins when the sensor is charging, connected to a USB port, or connected to software via Bluetooth wireless technology. The sensor is sensitive to high humidity. Do not use in a condensing environment. The sensor has built-in temperature compensation but the sensor can still be sensitive to rapid and/or large changes in temperature. The sensor is designed to operate best between 20 and 40°C. This does not prohibit the sensor from being used in temperatures outside this range. Just allow enough time for the sensor to stabilize at the desired air temperature. For more accurate results, the sensor can be calibrated at the temperature used. The recommended sampling rate is 0.5 samples per second or slower for this sensor. This allows the sensor to average a set of measurements before reporting a value. Gas must diffuse through the holes in the sensor tube before the sensor detects any changes in concentration. Because diffusion of gases is a slow process, there can be a delay in response time. To collect data in a controlled environment, it is recommended that you use the 250 mL Nalgene bottle that is included with this sensor. To collect data simultaneously with Go Direct CO2 Gas and Go Direct O2 Gas, it is recommended that you purchase either the BioChamber 250 (250 mL capacity) or the BioChamber 2000 (2 L capacity). Each BioChamber has a second opening with a grommet so that you can insert two probes at once. Because the sensor operates on the basis of reading IR radiation, you should avoid using the sensor in direct sunlight as much as possible. Even though the IR detector is shielded, it is best to avoid the possibility of reflected light affecting the readings by keeping the sensor in the shade when used outdoors. If the reported CO2 gas concentration appears to be incorrect (after the 180 second warm up), calibrate the sensor as described in the Calibration section. Keep in mind that indoor CO2 gas concentration can vary a great deal and that there can be unit to unit variability of up to 200 ppm CO2 between sensors. If the sensor is reading at or near the maximum range of the sensor, the CO2 concentration may be exceeding the maximum range of the sensor. Place the sensor in outside air or in ambient room air and wait for the readings to decrease. If there is no change in CO2 gas concentration during an experiment, it may be the experiment and not the sensor. Test the sensor by removing it from the reaction chamber and gently blowing on the shaft to see if it responds to exhaled air. If you have followed the troubleshooting steps and are still having trouble with your Go Direct CO2 Gas, contact Vernier Technical Support at support@vernier.com or call 888-837-6437. Support specialists will work with you to determine if the unit needs to be sent in for repair. At that time, a Return Merchandise Authorization (RMA) number will be issued and instructions will be communicated on how to return the unit for repair. Vernier warrants this sensor to be free from defects in materials and workmanship for a period of five years from the date of shipment to the customer (bottle and lid are excluded). This warranty does not cover damage to the product caused by abuse or improper use. This warranty covers educational institutions only.